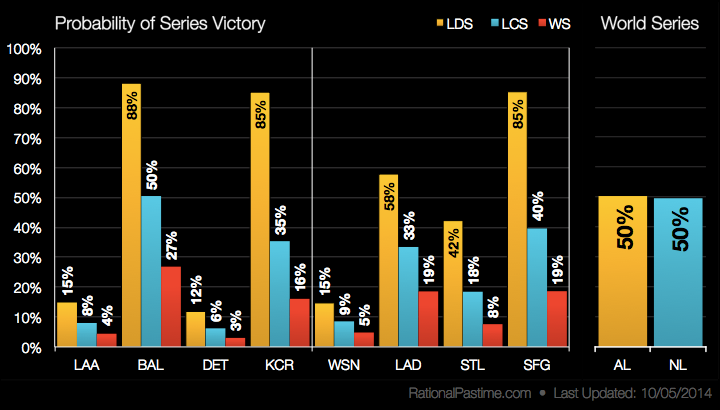 This post is part of a series tracking the postseason series win probabilities throughout the 2014 MLB Playoffs. Click here to enjoy the full series of posts. Thanks to an epic victory in eighteen frames on the road against the Washington Nationals, the San Francisco Giants have a chance to sweep the NLDS at home. 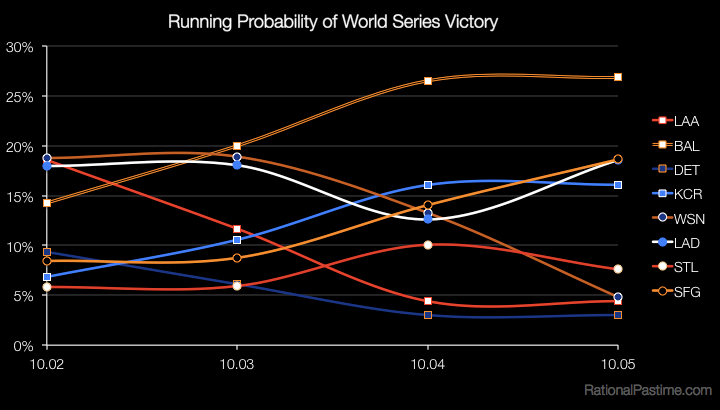 The field has separated into three distinct groupings, with the Baltimore Orioles maintaining their lead in World Series victory probability, the Giants, Los Angeles Dodgers and Kansas City Royals with a 16-19% shot, and four teams scraping the bottom—three of whom face elimination in their next game. The one-time favorite Nationals are now facing long 19-1 odds to win their World Series, while their erstwhile rivals have upped their chances to 4-1. In last night's other contest, the Dodgers evened it up at home against the St. Louis Cardinals, improving the former's chances to 19% and sinking the latter's odds back to 23-2. Following the longest postseason game in the history of Major League Baseball, the Nats are one loss away from an October tee time. 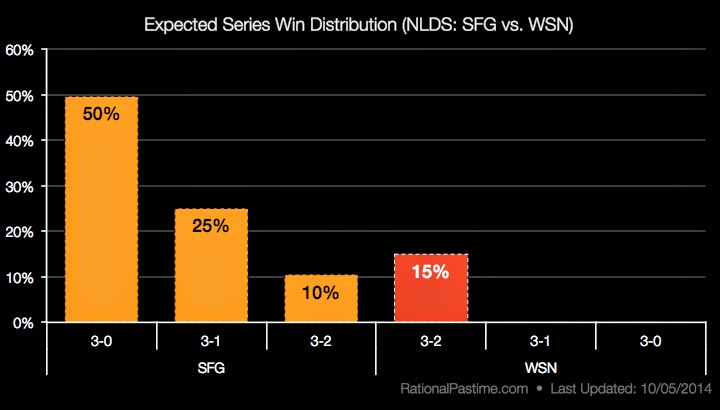 Playing at home, the Giants have a 50/50 shot of sweeping the series in Game 3. The Nationals will have to win two straight on the road force the series back to Washington, in which they would be favored (although, to this point, being favored hasn't meant much). With last night's win, the Dodgers regain the initiative, and the most likely series outcome is now a Los Angeles win in five. 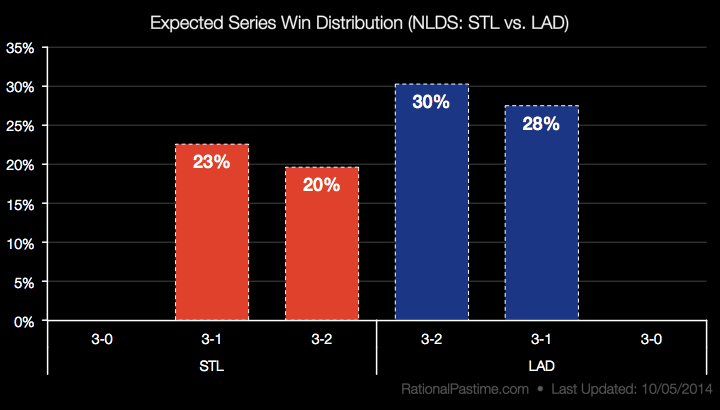 The Cards' best chance is to win it before the series returns to Dodger Stadium. The probability distributions for the ALDS remain the same after the off day. Check out yesterday's post to catch up. A Baltimore win over San Francisco in six or seven remains the most likely individual Fall Classic result. The most likely World Series match-up is now a replay of the 1966 Championship between the Los Angeles Dodgers. Stop by tomorrow for updated ratings, probabilities and charts following today's ALDS match-ups.